BBC News, Intersciences.org, UCLA Newsroom: Researchers at the UCLA Henry Samueli School of Engineering and Applied Science have developed a novel camera that captures images thousand times faster than any existing conventional camera. Dubbed Serial Time-Encoded Amplified imaging, or STEAM, the new imaging technique depends on carefully manipulating so-called "supercontinuum" laser pulses. These pulses, less than a pico-second long, contain a broad range of colors. Two optical elements spread the pinprick laser pulses into an ordered two-dimensional array of colors. This "2-D rainbow" illuminates a sample. Part of the rainbow is reflected by the sample - depending on light and dark areas of the illuminated spot - and the reflections travel back along their initial path. Because the spreading of the pulse's various colors is regular and ordered, the range of colors reflected contains detailed spatial information about the sample. The pulse then passes back through the dispersive optics and again becomes a pinprick of light, with the image tucked away within as a series of distributed colours. However, that color spectrum is mixed up in an exceptionally short pulse of light that would be impossible to unpick in traditional electronics. The team then routes the pulse into a dispersive fibre - a fibre-optic cable that has a different speed limit for different colors of light. As a result, the red part of the spectrum races ahead of the blue part as the pulse travels along the fibre. Eventually, the red part and blue part separate in the fibre, arriving at very different times at the fibre's end. All that remains is to detect the light as it pops out of the fibre with a standard photodiode and digitize it, assigning the parts of the pulse that arrive at different times to different points in two-dimensional space. Now researchers are looking for a possible application for the fast camera. "The most demanding application for high-speed imaging involves fast events that are very rare, rogue events or the proverbial needle in the haystack — in other words, unusual events that carry important information," said Jalali, a professor of electrical engineering and principal investigator of the project. Update: The original Nature Journal paper is here, for those who have a subscription. After the speculations that Omnivision might be the winner of Palm Pre 3MP sensor design slot, iSuppli says in Business Week article that the 3MP camera is possibly supplied by Aptina. It is expected to cost $12.39 or about 9% of the total Palm Pre built cost, according to iSuppli. Electronics Weekly: The Corot orbiting space telescope has discovered the smallest terrestrial planet ever detected outside the Solar System. The planet, which is less than twice the size of Earth, was identified using an array of four e2v CCDs. The CCDs are FT matrices of 2048 x 4096 pixels working in visible light in the MPP (Multi Phase Pin) mode at temperature -40C. The 13.5µm-sized pixels are back illuminated in improve QE in 370-950nm spectral range. Micron, which was acquired by Altera, and Pixim are major CMOS players - this funny statement is said to belong to Junichi Matagawa, Japan/Asia Marketing, Digital Image Sensor Products, Worldwide Application Specific Products, Texas Instruments Japan. Somehow, I doubt he really said that. It escaped my attention at the time, but almost a year ago PhaseOne announced so called "Sensor+" solution used in its medium format digital backs, co-developed with DALSA. From the first sight it appeared nothing more than a regular pixel binning used in may other CCDs. Upon closer examination, the order the binned pixels in Sensor+ is different. The details of it are shown on p. 3 in PhaseOne white paper. Yahoo: Nemotek has selected multiple lithography systems from SUSS. The deal includes a 200mm production mask aligner, coat, bake and develop systems. The systems have been selected for their image sensor wafer-level packaging (WLP) and wafer-level optics (WLO) services and were successfully installed at Nemotek’s facility in Rabat Technopolis Park, Morocco. EETimes UK reports that TSMC is developing a new CMOS image sensor process for 2-, 5-, and 8MP designs, despite it already has a new 0.11um process. TSMC also develops 3D process extensions. By June, it will ready its 300mm fab for TSV applications. Digitimes' sources are critical of Asustek decision to adopt a 1.3MP sensor for its consumer ultra-low voltage (CULV) notebook to be launched in the second half of 2009, because the thickness of 1.3MP module, compared with a VGA one, is likely to hinder sales of CULV notebooks, marketed for their slimness. Acer and HP have adopted VGA sensor for their CULV notebooks. Yahoo: Omnivision unveiled its AutoVision solutions for usage in driver assistance applications such as back-up camera and blind spot detection systems. The ultra-compact 1/4" OV7960 and OV7962 deliver responsivity of 12V/lux-sec in what is claimed to be "the world's smallest automotive qualified package - up to 50% smaller than competing CMOS devices". The 62-pin CSP package size is 6.67 mm x 7.12 mm x 0.71 mm. The OV7960 is optimized for interlaced NTSC/PAL signal formats to directly interface with in-car LCD screens or devices with 75 Ohm loading, while the OV7962 is optimized for digital progressive and analog applications. Both versions operate across a wide-temperature range, from -40 degrees C to 105 degrees C meeting AEC-Q100, grade-2 requirements. Samples are immediately available with volume production planned for the third quarter of calendar 2009. According to TSR, the percentage of new vehicles with integrated cameras is projected to increase from ~20% in 2008 to nearly 70% in 2012. Yahoo: Tessera announced that is has extended its OptiML Focus and OptiML UFL image enhancement solutions to support resolutions up to 14MP. The OptiML Focus solution enables all objects from 30cm to infinity to be in focus at once, and the OptiML UFL solution increases the amount of available light as much as 250%, without degrading the field depth or other performance factors. OptiML Focus and OptiML UFL image enhancement solutions for 5 to 14MP are available for licensing now. Zacks Investment Research is "reasonably confident about [Omnivision's] strong comeback in the post-recession period." Zacks is a little concerned about the level of inventory, and believes that Omnivision could have a hard time bringing it down. OmniVision's market share is 30% of the total image sensor market, according to Zacks. Engineering TV features Aptina's promotional video showing global shutter advantages over rolling shutter. The demo is carefully designed to make this advantage most evident. Digitimes: The number of image sensors used in each automobile will jump to eight or even ten in the next five years from one currently, Digitimes sources estimate. One image sensor will monitor the rear view, one more in the front and two at the sides will aid driving and several interior sensors will monitor the behavior of the drivers or passengers. Advanced Imaging Magazine published E2V's popular article on low-light image sensor basics, such as 3T vs 4T, BSI vs FSI, rolling shutter vs global shutter and electron multiplication CCDs. The article is illustrated by e2v sensors data. 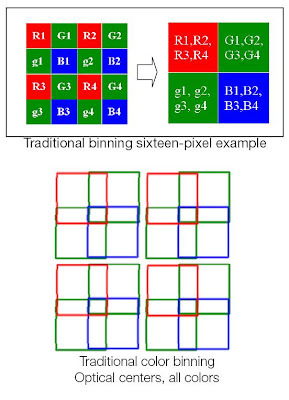 A CMOS image sensor densely and uniformly placed the retinal rod- and cones-like WRGB pixels with lateral overflow integration capacitors having the different sizes in each color has been demonstrated. A 1/3.3-inch, 4.2-um effective pitch, 1280(H) x 480(V) checker-pattern pixels CMOS image sensor was fabricated and has achieved color-independent saturation and about twice the effective sensitivity compared with conventional Bayer-RGB color filter image sensor made at the same time. A low noise CMOS image sensor without degradation of saturation performance has been developed by using column amplifiers of the gains of about 1.0 in a lateral overflow integration capacitor technology. The 1/4-inch, 4.5-um pitch, 800(H) x 600(V) pixels CMOS image sensor fabricated by a 0.18-um 2P3M technology has achieved fully linear response, 0.98 column readout gain, 100-uV/e- conversion gain, 2.5-e- random noise, 110,000-e- full well capacity and 93-dB dynamic range in one exposure. Webwire: Vision Research announced a very fast 4MP camera capable of 1,400fps speed at its full-resolution of 2,560 x 1,600. The Phantom v640 camera incorporates a custom-designed CMOS sensor with improved QE of 60% (peak). The camera will be available with either a color or monochrome CMOS sensor. The color sensor is rated at ISO 1,000 and the monochrome sensor is rated at ISO 4,000. The Phantom v640 also incorporates Vision Research’s Extreme Dynamic Range (EDR) technology. EDR allows users to capture two different exposures within one single frame. Digitimes reports that the proportion of Samsung image sensors used in HTC handsets is expected to reach 50% with a more competitive pricing at the end of 2009 amid sales of HTC's 5MP smartphones. Currently 60-70% of HTC's handsets use Aptina's products, according to Digitimes' sources. Globes: 3D imaging technology vendor 3DV Systems is laying off most of its staff towards the sale of the company's activity to Microsoft. Its controlling shareholder announced that it had signed an MOU with Microsoft for the sale of its 43% stake in 3DV at company value of $34M. Electronic Design reviews recent reports about new developments in image sensors. Nothing is new there, but it's nice to see everything in one article. In an inset the article says that CCDs continue to deliver better performance than CMOS sensors, a claim that many would disagree with. EETimes reports that Micron's Avezzano fab in Abruzzo region 60 miles east of Rome is close to the area stricked by a powerful earthquake. This fab is responsible for the image sensor production by Aptina. The plant was originally constructed by TI but was subsequently taken over by Micron. If the fab is damaged, we might see Aptina sales plummeting this quarter, unless Boise fabs take the load. Yahoo: Tessera announced that China-based Qtech has licensed Tessera’s OptiML wafer-level optics (WLO). The combination of Tessera’s OptiML WLO and the previously licensed SHELLCASE wafer-level packaging will enable Qtech to manufacture low-cost, reflowable VGA cameras for mobile and notebook applications. Camera phones comprised nearly 81% of area-array image sensor shipments in 2008, a share that is expected to shrink only slightly through 2013. 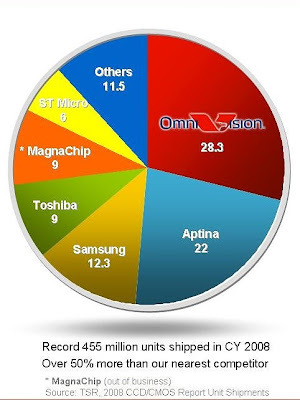 CMOS sensors dominated image sensor shipments in 2008, with more than an 87% share. By 2013, CCD is expected to comprise less than 4% of the total area image sensor market. CMOS will make up 62% of security camera image sensors by 2013. While CMOS is gaining in digital still cameras, it will not surpass CCDs until 2013. Worldwide unit shipments of image sensors in camera phones continue to rise, mostly as a result of the continuing penetration of dual-camera phones in Asian markets. These phones utilize both a traditional point-and-shoot camera, as well as a second, inward-facing camera for two-way video communication or videoconferencing. Digitimes: Omnivision has adopted more aggressive pricing for its 1.3MP sensors, regaining part of its lost market share in the China market from SETi. OmniVision has also started ramping up output at TSMC, according to Digitimes' sources. OmniVision is expected to also adjust the price of its VGA products soon, the sources noted. Yahoo: Pixelplus announced that, on March 19, 2009, the US District Court for the Southern District of New York granted final approval of the settlement of the previously-disclosed consolidated shareholder class action lawsuit commenced against the Company and certain of its current and former officers and directors in April 2006. All claims against the Company and its current and former officers and directors have been dismissed with prejudice and without any admission of liability or wrongdoing. Barron's: Aptina's image sensor sales were down 54% for the quarter ended on March, 5, 2009, due to a sharp drop in units relating to weakening consumer demand. Gross margins of imaging products fell to 2%, from 29% in the previous quarter. Imaging revenues were down 53% from quarter-to-quarter, primarily due to weakness in the mobile phone market. Imaging gross margins were down as we experienced a slow down in unit sales and production, driving up per unit costs. Imaging gross margins did, however, remain positive at 2.8%. Digitimes quotes a rumor that the next generation iPhone will feature 3.2MP sensor from Omnivision. Same rumor also says that Omnivision was also selected as a supplier for 5MP Apple product to appear later in 2009, which might be iPhone or the much-rumored Apple MID. Update, April 15: Wired quotes another Digitimes article and analyst response on it, seems to confirm that Omnivision supplies 3MP sensor the next generation iPhone. Yahoo: Sensata was the latest owner of Smallcamera technology, acquired from Cypress. It had announced the intention to sell its Vision business in December 2008. Today Sensata and Melexis announced the signing of an agreement to sell Sensata's Vision business to Melexis. The transaction is expected to close by the end of April. The Vision business provides CMOS imagers and imaging modules to automotive advanced driver assistance systems for customers such as Bosch and Delphi. Melexis Chief Executive Officer Rudi DeWinter states, "The wide dynamic range camera technology from Sensata's Vision business is complementary to our current imaging sensors and fits very well with the trend of increasing use of vision products to enhance safety in cars." Yahoo: Omnivision unveiled its latest OV7960 SoC solution for CCTV applications. The OV7960 features the light sensitivity of 12V/lux-sec. Featuring 6 x 6um OmniPixel3-HS pixel, the OV7960 provides the full functionality of a single-chip digital/analog NTSC/PAL sensor. The OV7960 operates at 30fps in VGA mode, 50fps in PAL mode and 60 fps in NTSC mode and has an active array size of 768 x 576 to support both PAL and NTSC outputs. The OV7960 incorporates image processing functions, including exposure control, gain control, white balance, lens correction and defective pixel correction to provide full-frame images. For storage purposes, the OV7960 includes 16 bytes of OTP memory. The OV7960 features automatic exposure/gain with 16 zone control, horizontal and vertical windowing capability, aperture/gamma correction, external frame sync capability. The OV7960 is immediately available for customer sampling with volume production slated for the second half of calendar 2009. PRNewswire: Toshiba announced the availability of the new ImaTuning image sensor calibration tool, currently available free to Toshiba image sensor customers. ImaTuning is a hardware and software platform that runs on a PC and lets customers tune their Toshiba image sensor to match the performance needs of their target application, primarily digital cameras in mobile phones. Yahoo: Toshiba announced two new 1.75um pixel based products. The 8MP 1/2.5" format sensor (part number ET8ER4-AS) is intended for use in high-end camera phones that offer auto-focus or optical zoom capabilities. 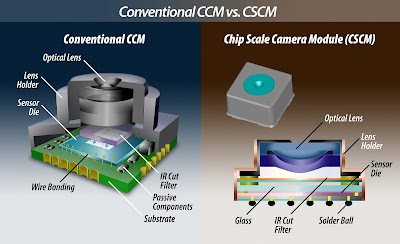 The 2MP 1/5" format chip scale camera module (CSCM) uses TSV technology to allow mounting and assembly of camera components in the chip wafer during manufacturing to reduce the module's size by as much as 64 percent in comparison to other camera modules. It features an integrated image signal processing function to give the CSCMs more digital still capture-type functionality. Engineering samples of the 8MP image sensor are available now, with mass production scheduled to begin in Q2 2009. It is sample priced at $20 each. The 1/5-inch format 2MP CSCM will be in mass production in Q2 2009 and is sample priced at $10 each.